The Nashville City Paper reports that Blood of Angels, by Reed Arvin, explores a disturbing side of Nashville's relationship with its blossoming immigrant community. 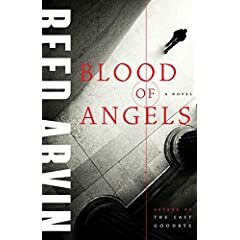 "He's been at various times a cattle rancher and a professional musician, but Reed Arvin is now a highly successful mystery and suspense author. His current book Blood of Angels (HarperCollins) spotlights his latest character Thomas Dennehy, a senior prosecutor in Davidson County, and it profiles an explosive case that incorporates both rising racial/immigrant tensions, intra-office politics and an odd romance." "The book provides readers with a look at a changing Nashville, something Arvin, who signs copies of his new novel Tuesday night at Borders, said he really wanted to chronicle." The book signing is at 7 p.m. Tuesday at Borders Book Store at 2501 West Ave. Cost is free; more information at 327-9656. "Did he send an innocent man to the death chamber years earlier? New DNA evidence suggests he did. And will he do it again with a Sudanese immigrant named Moses Bol? Bol is accused of murdering a white woman and Arvin describes a racially polarized melting pot that bears no relation to country-music Nashville. As someone in Blood of Angels puts it, 'Welcome to the new South, pal.'" "Dennehy's narrative is refreshingly sardonic: 'a handful of tourists are wandering around, probably wondering why Toby Keith or somebody isn't standing on a street corner playing guitar.' And Arvin works hard to articulate the city's racial tensions. He risks letting Dennehy sneer, and he surrounds his main character with cynics." "'Maybe in Sudan, he's a genius,' one says of Bol, who is given very short shrift here because he speaks no English. 'He's probably the greatest cow herder in the history of the African continent.' Now Bol rounds up shopping carts at a Wal-Mart." "Thomas Dennehy, senior prosecutor in Davidson County, Tennessee, doesn't recognize Nashville anymore: a decade of relentless immigration means cops are learning Spanish, and the DA's office is looking for Vietnamese translators."